Since returning to the United States, I’ve (David) been working as a user advocate helping people connect with the Word of God in different languages and helping people to engage with the Word of God in a language they can understand. I decided to make a partial list of how many different languages people have asked about that I responded to that I was able to help them connect with. Lingala (Congo & DRC) while this translation exists, it is not yet available in the YouVersion app. I was able to share that it is available with a partner Faith Comes By Hearing’s bible.is app. There are currently 1068 languages available to read all or part of the Bible, in addition to helping people connect with a language that speaks directly to their heart I’m answering all types of questions. Please pray for the team that is working with Bible Societies around the world to get every language that has a translation added to the app so everyone can have access to the Word of God. Fighting to #EndBiblePoverty one question at a time. This entry was posted in Wycliffe and tagged Bible Translation, YouVersion. Bookmark the permalink. 4 Responses to Where’s my language? YouVersion is a powerful tool. 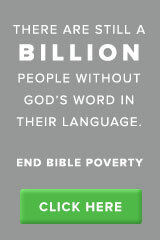 We are praying that God will continue to use you to help end Bible poverty. Thanks Tracy, I’m glad you like the visual.